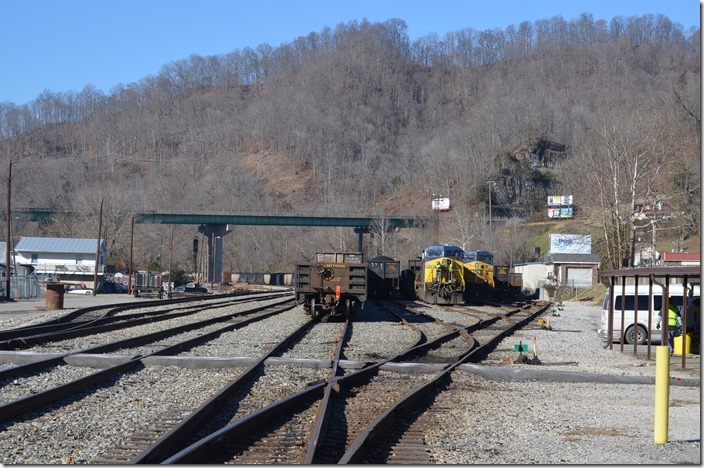 On Friday, Dec. 12th 2014, I took a day of vacation for some railfanning. 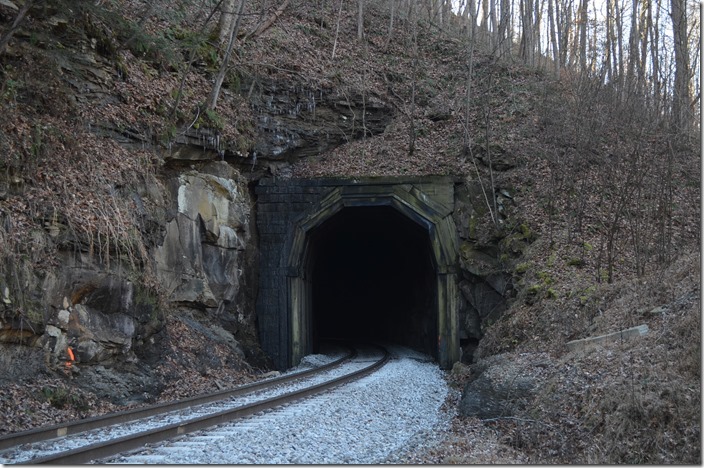 Doing research on John Watson’s upcoming book on C&O tunnels got me interested in visiting Blue Tom Tunnel. I had always imagined that it would require a lengthy walk to access, but John Joseph revealed to me at the Huntington Model Railroad Show that you could drive to the end of the bridge at the east end of the tunnel. Although it was a beautiful day, I didn’t activate the scanner until I got to Danville (I don’t like distractions from the mission). Nothing was going on at the yard, although there were at least a couple of tracks full of empties and a like number full of loads. There were only one or two vehicles at the yard office. A train was parked at Beth Mine half loaded. 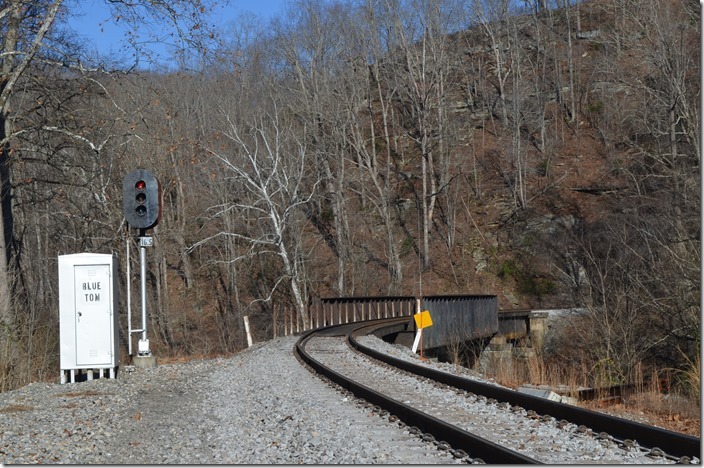 I turned off US 119 and drove the five mouth south up Little Coal River. From the actual forks of Coal River (“Forks of Coal” flag stop) the railroad continues another two miles up Big Coal River before splitting at Sproul. 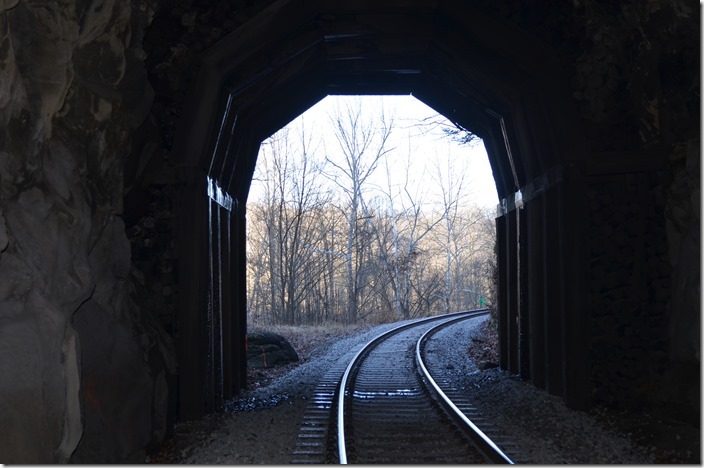 Here a 951’ tunnel enabled the Coal River SD to reach the Little Coal side without having to do two miles of construction along the river where a short tunnel would do. 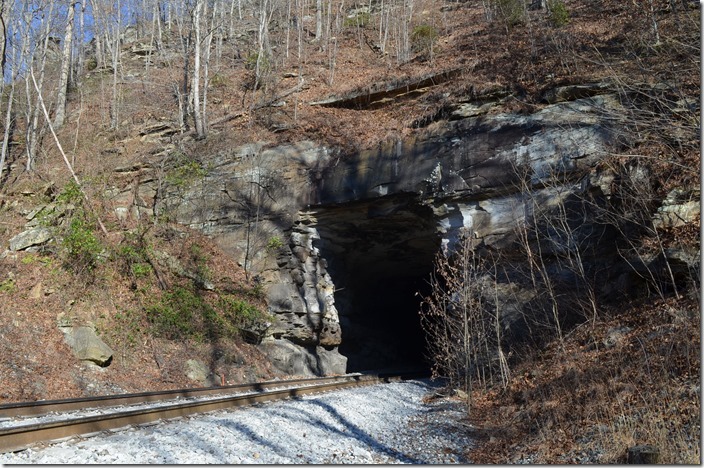 Little Tom Tunnel is less than a mile on up the east bank of the Little Coal River. Constructing it enabled the engineers to avoid a mile long bend in the river. Coming out of the tunnel the Coal River SD crosses to the west side where it stays until Rock Creek. 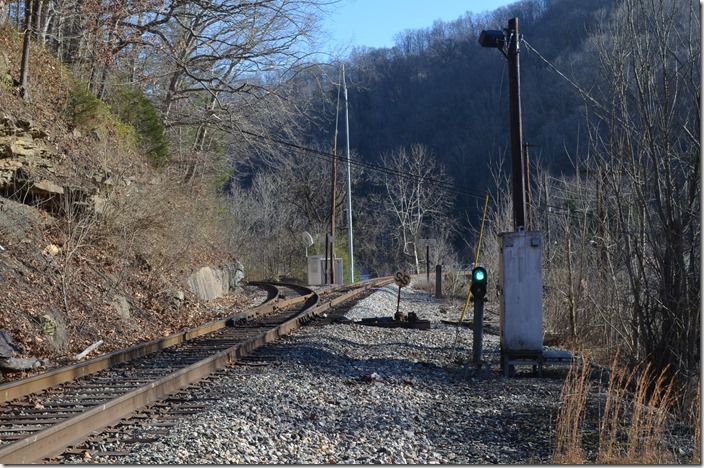 Here it crosses back to the east side and enters Danville Yard. 1. East portal of Blue Tom Tunnel and bridge #165. 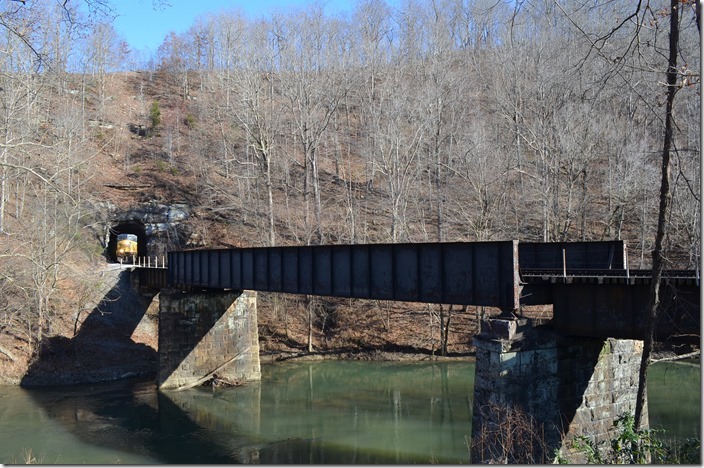 Both were constructed 1902-03 as part of the Coal River Ry. Exiting is CSX 401-88 on e/b E591-09 (Russell-Danville empties) consisting of ISGX (Arcelor Mittal Steel) ex-Bethlehem Steel coke hoppers and Coalveyor tubs. 2. East portal of Blue Tom Tunnel and bridge #165. View 2. 3. Westbound Blue Tom block signal 16.5. 4. Bridge #165 and Blue Tom Tunnel. Note the Koppers concrete ties. 5. Bridge #165 and Blue Tom Tunnel. View 2. 6. Bridge #165 and Blue Tom Tunnel. View 3. 7. 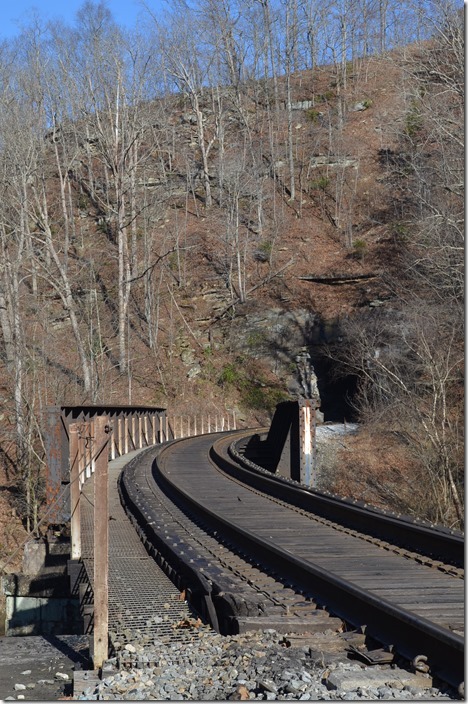 Bridge #165 and Blue Tom Tunnel. View 4. 8. 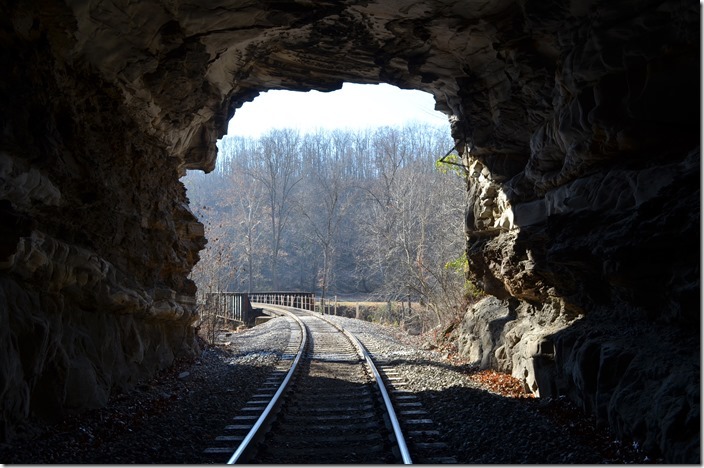 Timbering has been done at the west end of the 403 ft. bore through natural rock. 9. West portal. 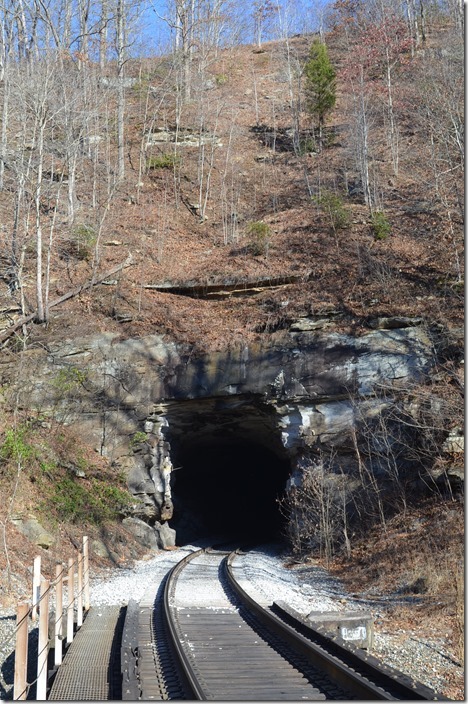 CSX Blue Tom Tunnel. 10. E591 had arrived at Danville Yard. Shifter crew H840-12 are getting on engine 397. 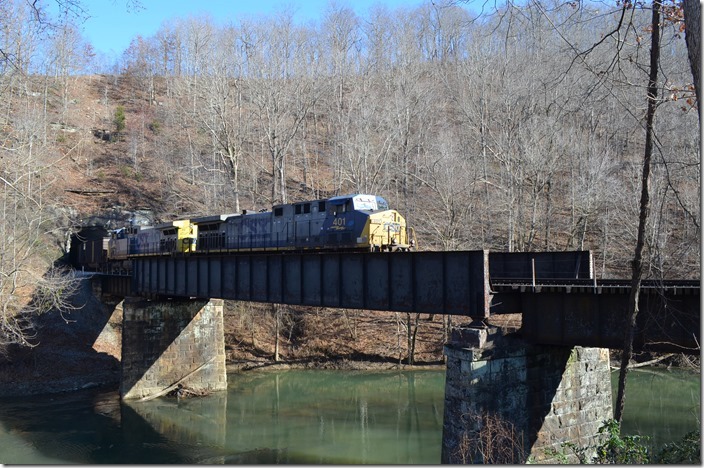 E591’s 401-88 will be used on H840-12 in push-pull mode for loading at Lick Mine up at the end of the Pond Fork SD. A carman had to come out of S. Charleston to check some cars on their train, and H840 would not get out of town until after I headed for home. 11. I waited around Pond Junction for a while hoping H840-12 would round the bend, but it didn’t happen. I’m standing on the Coal River SD to Sharples. On the right is the Pond Fork SD to Lick. 12. 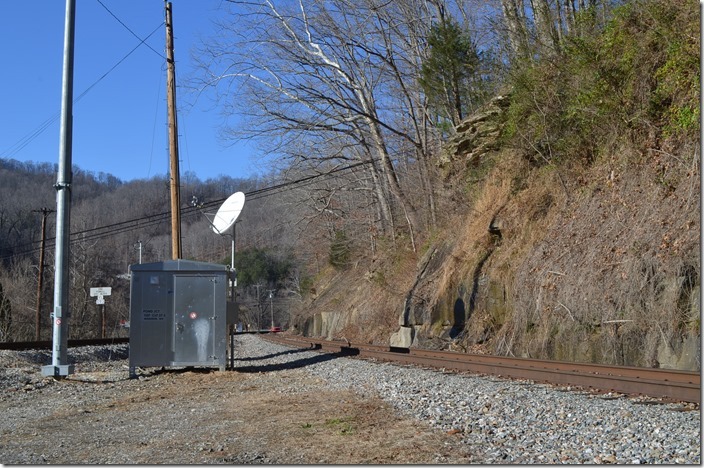 New communications equipment have been installed at Pond Jct. 13. The spring switch is aligned for the Pond Fork SD which historically has generated the most carloadings. The sun was going behind the hill, so I headed home. 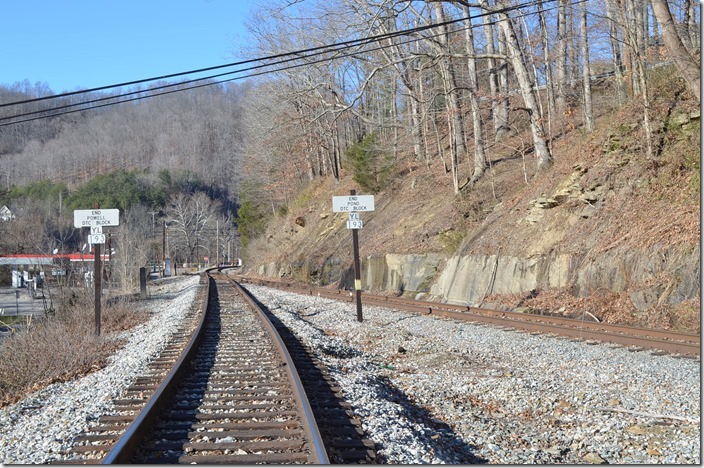 Copyright 2011, CSX Transportation Historical Society.